Populi Billing helps you manage student billing for your school. It handles the tuition-and-fees side of things (as opposed to, say, the financial aid side of things). Billing is comprised of reports, all of which either link to an item that lets you take action or let you perform some bulk action. 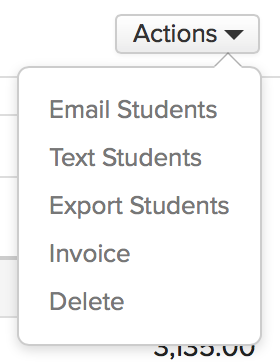 Email Students opens Email with a Quick List of the students shown on your report. Text Students lets you text message the students shown on the report. Students must have a verified phone number for text messages in order to receive the text (all others will be sent an email). Export Students creates a spreadsheet of the report; you can then add additional columns to your report before you finish exporting. Pending charges are charges connected to student accounts that haven't yet been invoiced. They may have been manually added on the student's Profile > Financial view, or were automatically triggered by Fee Rules or Tuition Brackets. Use the filter to focus the report on particular kinds of charges. When you perform an action (email students, invoice, etc. ), it will only affect the students/charges returned by your report filter. The Description column briefly summarizes why the student was charged or credited; the more link on some descriptions shows the remainder of longer descriptions. Amounts shown in black are owed by the student; amounts shown in red are credited to the student. Click a student's name to go to their Profile > Financial view, where you can, among other things, invoice them individually. Invoice: This lets you invoice all of the charges returned by your report filter. Enter or modify the due date and/or posted date. Click the Invoice... button to finish. Delete: This lets you delete the charges returned by your report filter. Current Balances lists all students with positive or negative balances (excluding financial aid) as of the date shown in the filter. You can show balances as of different dates, and also include students with $0.00 balances if so desired. 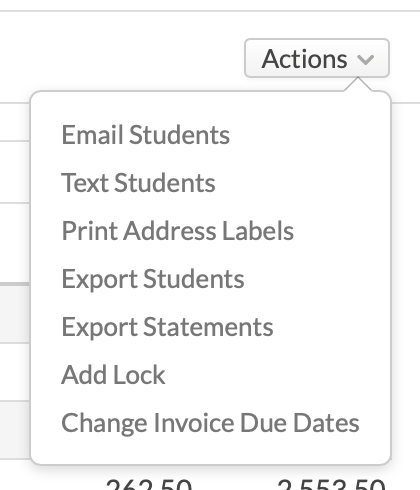 Filter the report to show students with a credit (negative) balance (you can add additional filters as well). Check the students to whom you wish to issue refunds. Click Actions and select Issue Refund Checks. Select the Refund Source, Account, and adjust the check number (if necessary). Click Show details to see the list of checks you're about to generate. If it all looks good, click Issue and Print. Unpaid Invoices shows all posted invoices that have not been completely paid off. If you export this report, you'll see an additional column showing any pending financial aid allocated to each invoice. Print address labels: This lets you print address labels for all the students shown on the filter. Export statements: Exports overall financial statements in the format of your choice. This is the same statement you get from a student's Financial > Dashboard view. Add Lock: Apply a financial lock to the students shown on the report. Change invoice due date: Lets you change the due date for all the invoices returned by your filter. Unapplied Payments/Credits gathers together all such payments and credits. You can filter this report by Posted Date, Type, Amount, and Amount Applied/Available. This report lists any deposit that has either not been paid by the student or has not been applied towards the student's balance. Use the account filter to focus the report on particular kinds of deposits. Read this article to learn about how you can set up and use deposits. This report shows the due dates for individual payments—which might refer to individual invoices, groups of invoices, or individual installments on a payment plan. The Term Summary displays a list of all students with any pending or invoiced charges, the various charges, a summary of pending or disbursed aid, and the total they owe after aid. This report only shows such for the academic term displayed in the term selector; selecting a new academic term automatically refreshes your report. The amounts in the Total Owed column shown in black are owed by the student; amounts shown in red are credited to the student. Toggle between your report and Dashboard displays; the Dashboard shows the entire term's data summary regardless of the filters used on your report. Charges breaks up the Term Summary into individual charges and credits. Since students typically have multiple charges applied to their accounts each term, individual students may appear on this report multiple times. The report only shows charges for the academic term displayed in the term selector; selecting a different academic term automatically refreshes your report. If you've enabled recurring payments (and you have payers who have opted to pay you this way), you'll find all recurring payments in this report. The report sorts payments by the most recent start date. Use the filter to focus the report on particular kinds of recurring payments. Email/text payers: Lets you communicate with the payers (not the students) shown on your report. Export XLS: Creates a spreadsheet of your report, including any filters and column sorting. Link to payer: If this recurring payment isn't yet linked to a person or organization, click this. Select Person or Organization and start typing a name. Select from the suggested results, or follow the prompts to add a new person or organization if they're not yet entered in Populi. Show history: This shows a list of all payments made in this series, including links to the individual payment pages. Change payment info/amount: Update any of the payment info details (credit card number, address, etc.) and the payment amount. You must fill in the entire form in order to save changes to any of this information. Change schedule: Select a different day of the month on which to run the recurring payment transaction. 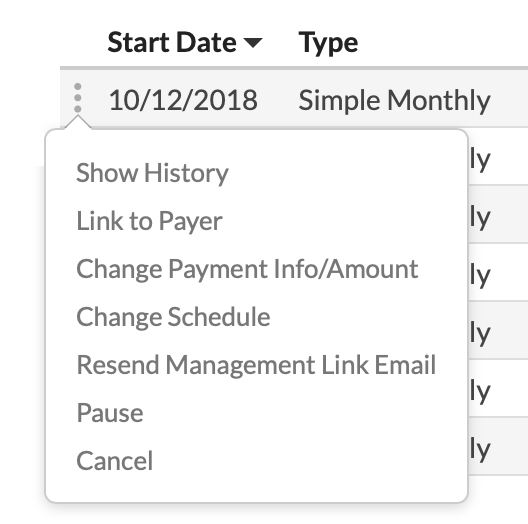 Pause/resume: This lets you pause the recurring payment, or resume one that you paused earlier. Cancel: Cancelling a recurring payment only affects future payments. This report lists all invoiced charges and credits. It defaults to show those posted in the last 30 calendar days. Click the invoice or credit number to see its page. Use the filter to focus the report on particular kinds of transactions. Export creates a spreadsheet of your report. This report lists all Payments and Refunds, defaulting to show those posted in the past month. Click the Payment number to see its page. Filter your report to show different Posted Dates or Terms, and Detail Levels, or individual Types, Payer Types, Payment Methods, Online Payments, or Amounts. Print Receipts prints all visible receipts. Choose whether to print using the Default PDF layout, a Custom Receipt layout, or Envelopes addressed to the payers. The Aging report shows you student balances and how they've looked over the past 4+ months. Each column shows the net increase or decrease in the student's balance over the time period in the column heading. For example, if Sleepy Brown's "0-30" column shows $1000, then that means his balance increased by a thousand semolians in the past 30 days. Click Export to create a spreadsheet of the report.